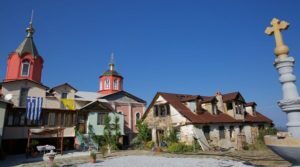 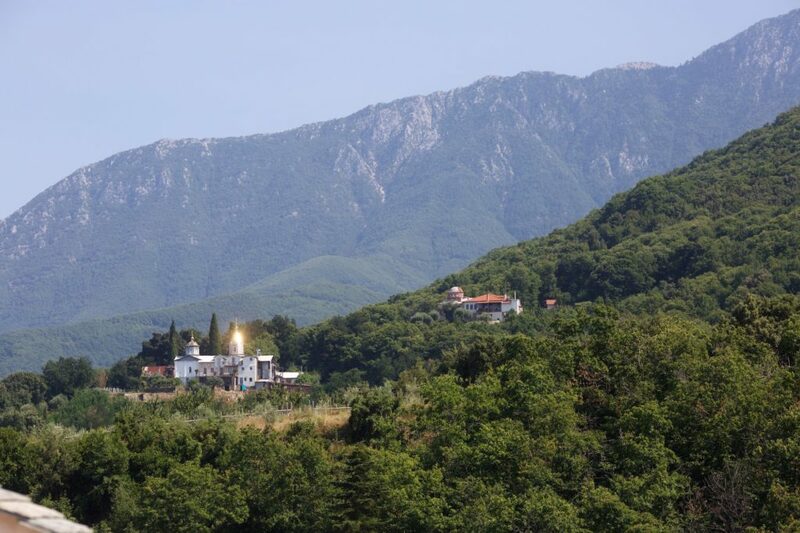 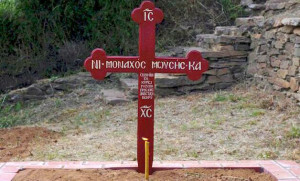 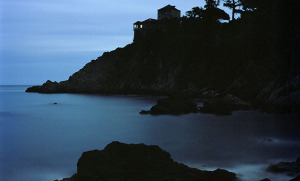 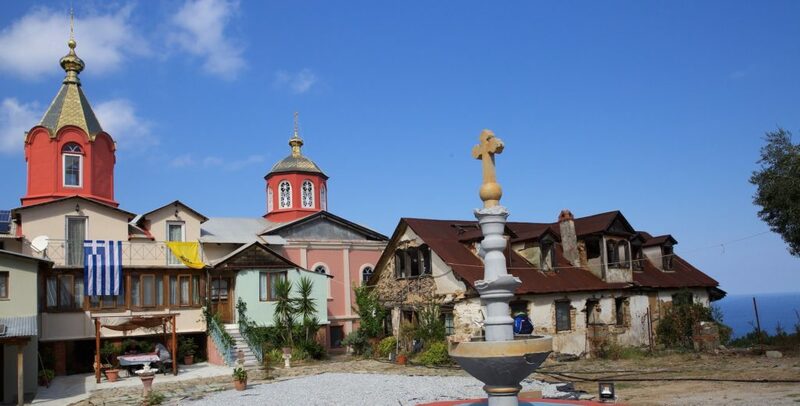 The restored kelli of the Precious Cross, as seen from the Holy Monastery of Karakallou, with Athos as the backdrop. 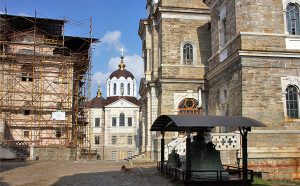 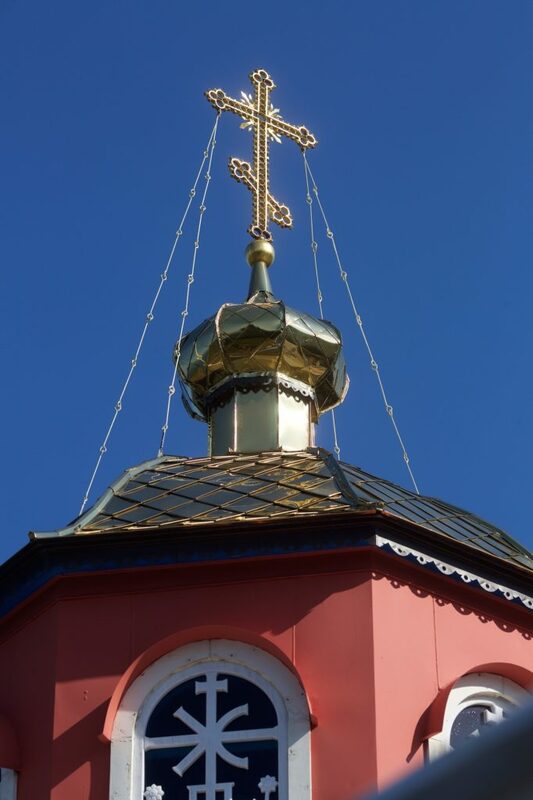 The highly-polished cupolas of the church bear witness to the fact that Russian monks once lived there. 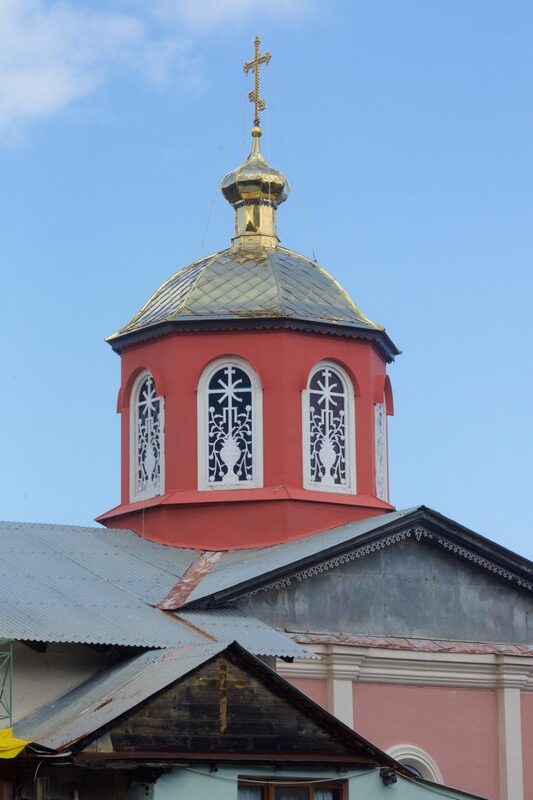 The renovated and beautifully bedecked church, displaying the care lavished upon it by Father David, the elder of the kelli, awaited the ceremony of the inauguration like a bride. 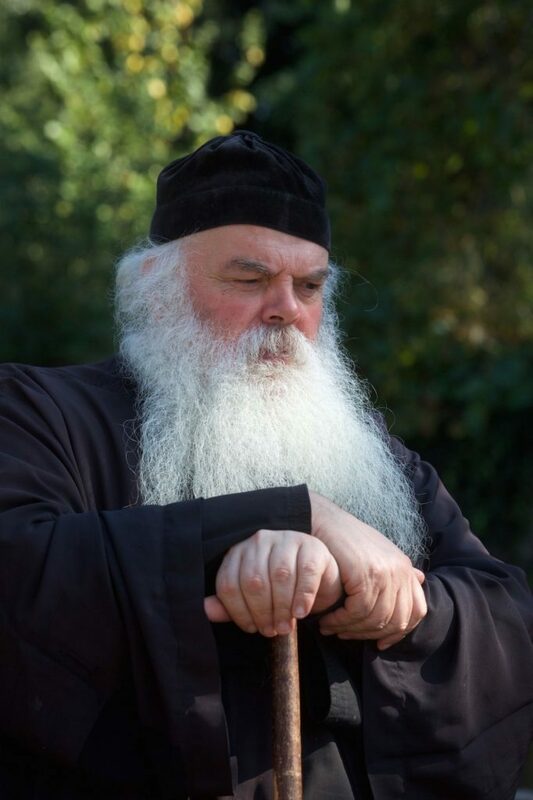 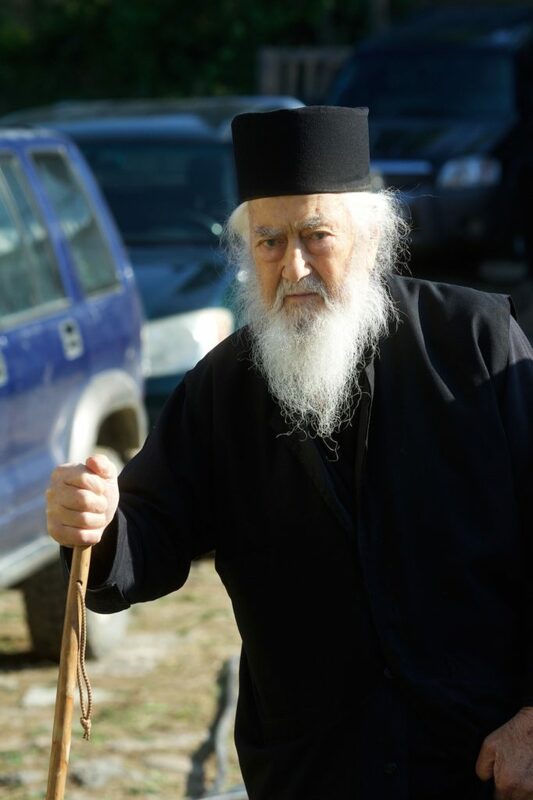 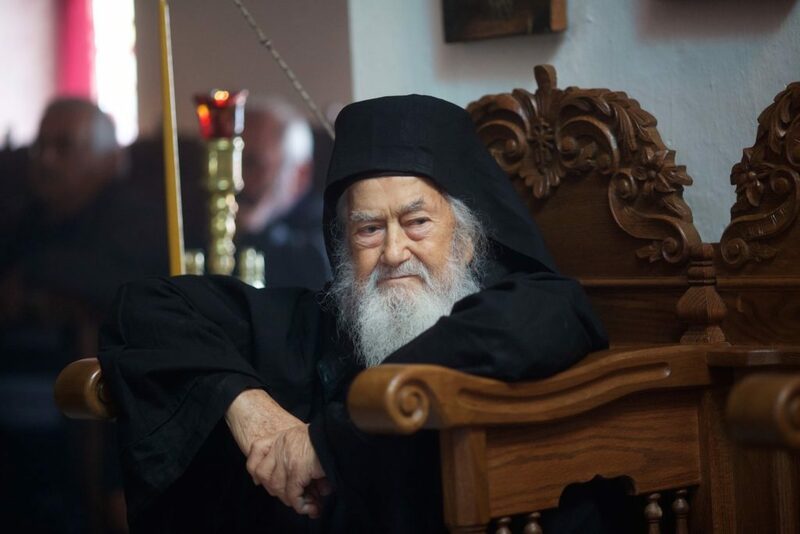 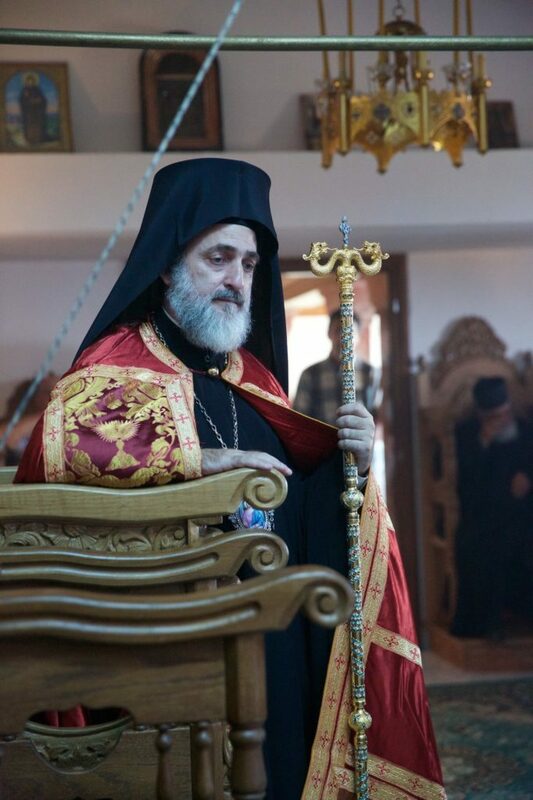 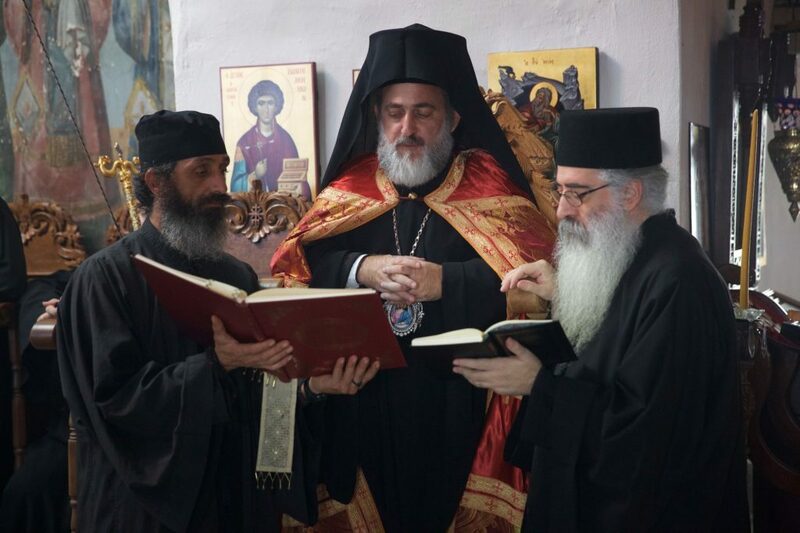 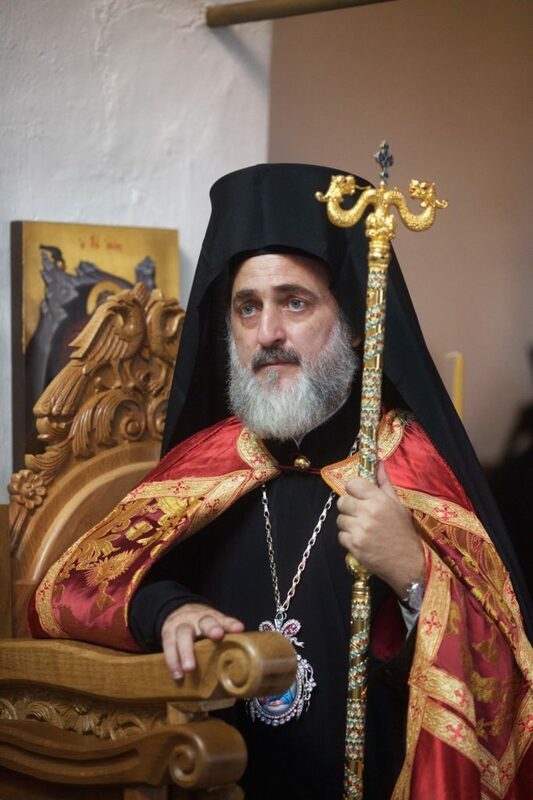 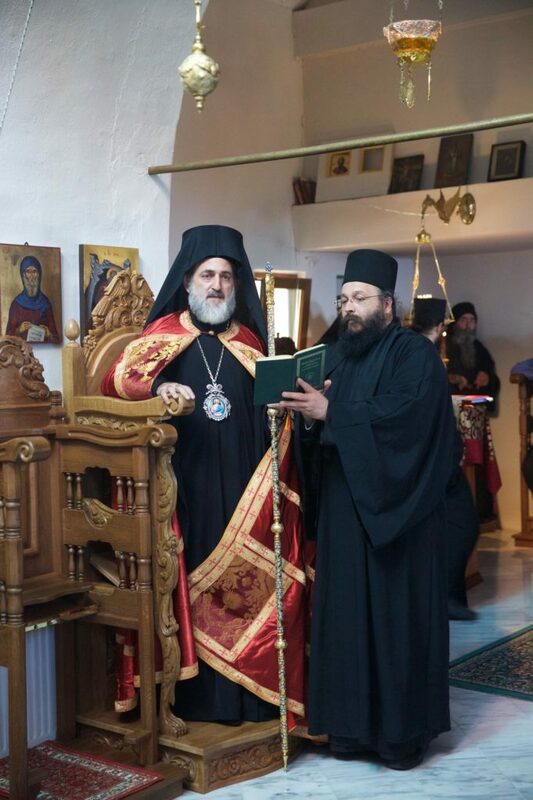 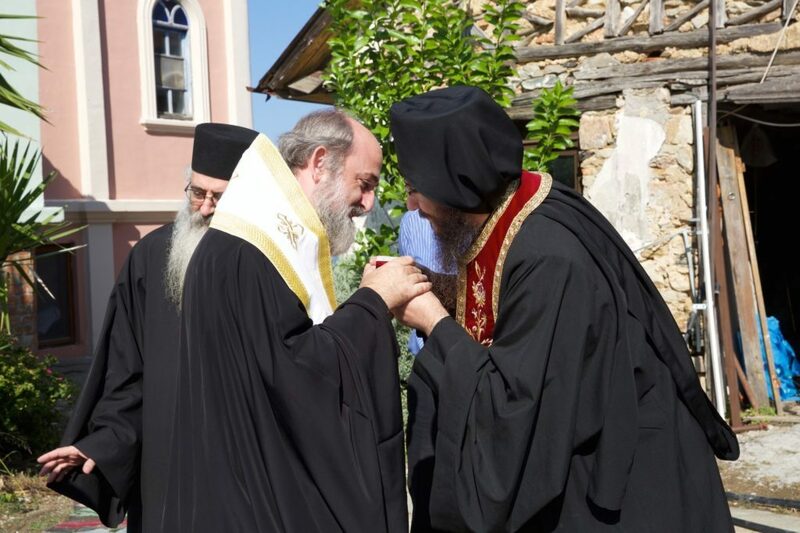 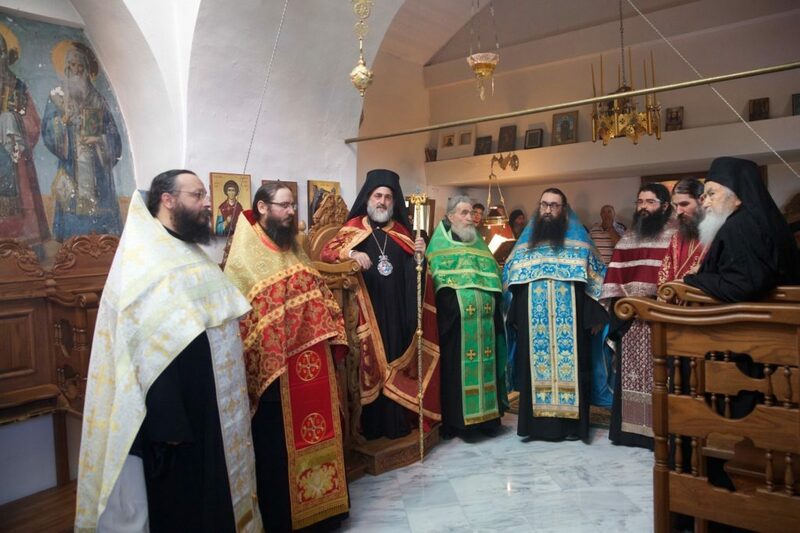 The arrival of His Eminence Metropolitan Ioakeim of the Patriarchate of Jerusalem. 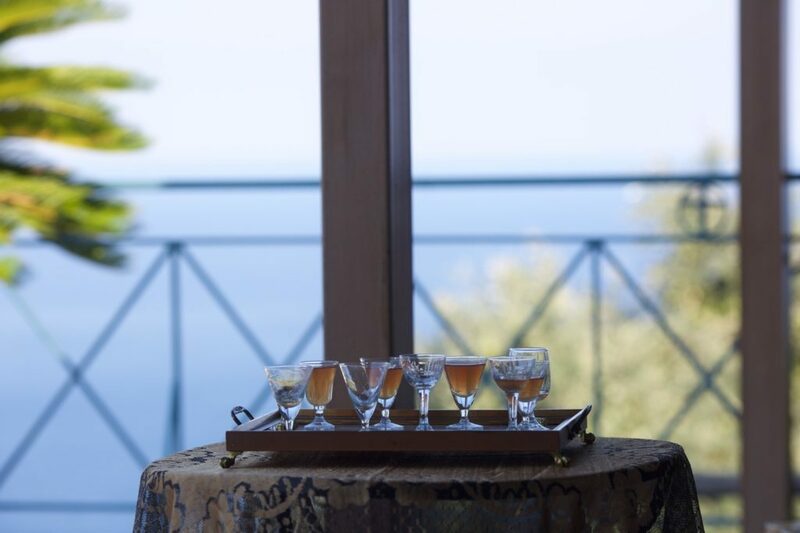 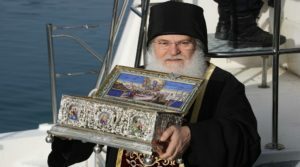 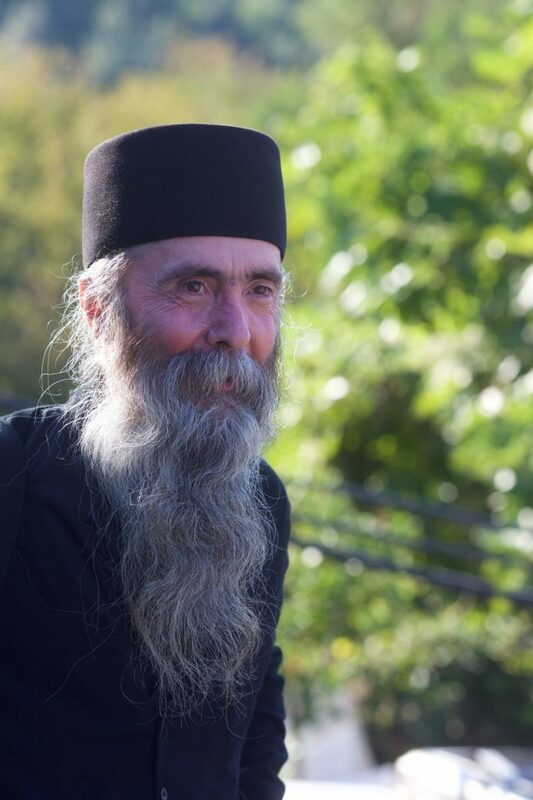 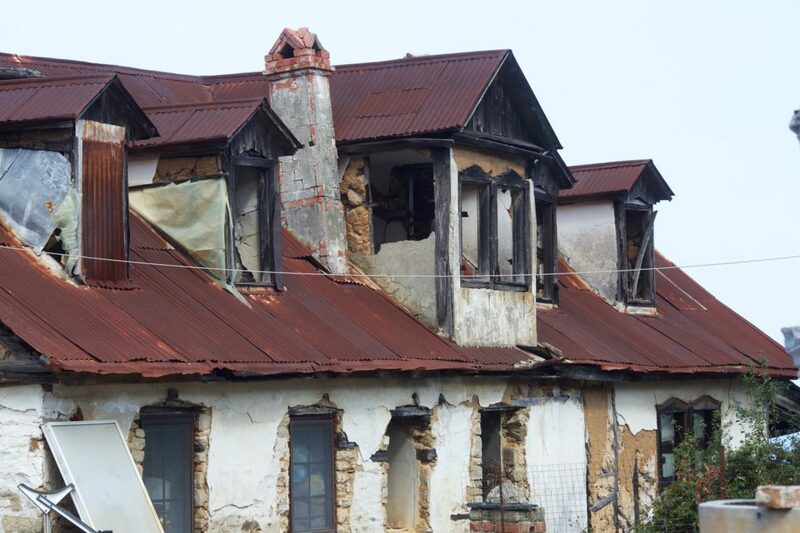 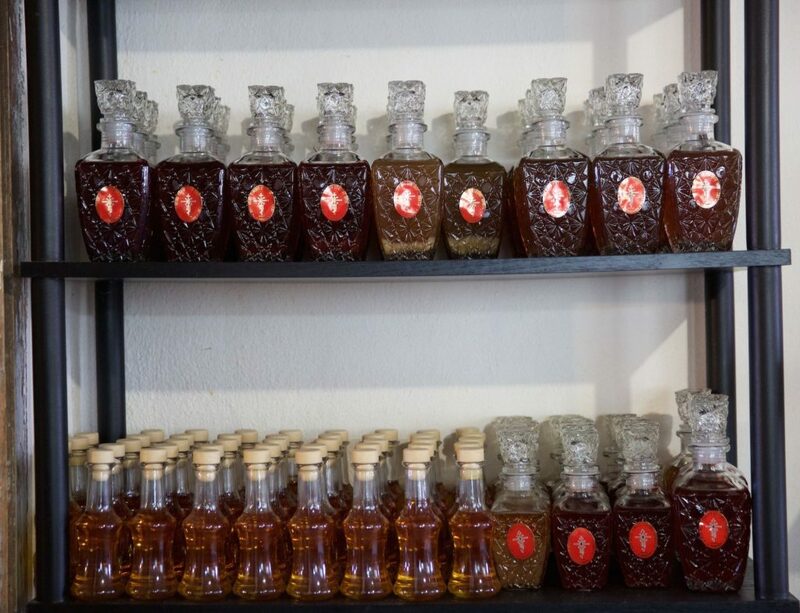 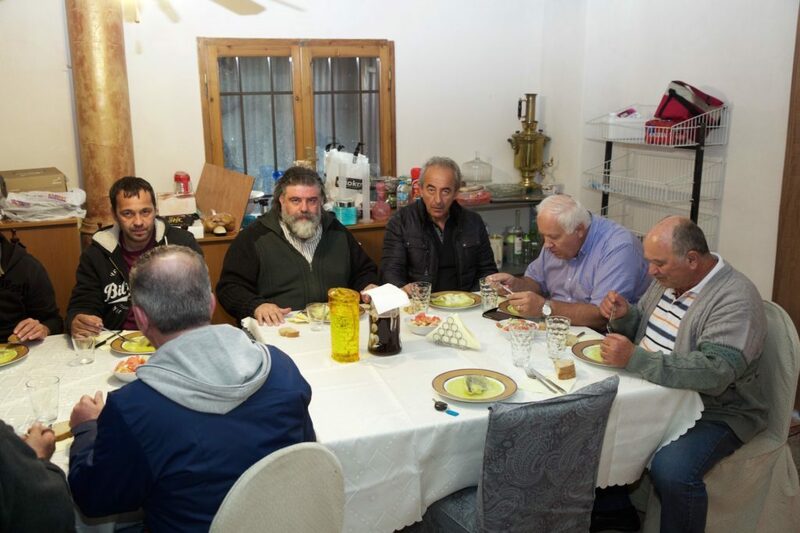 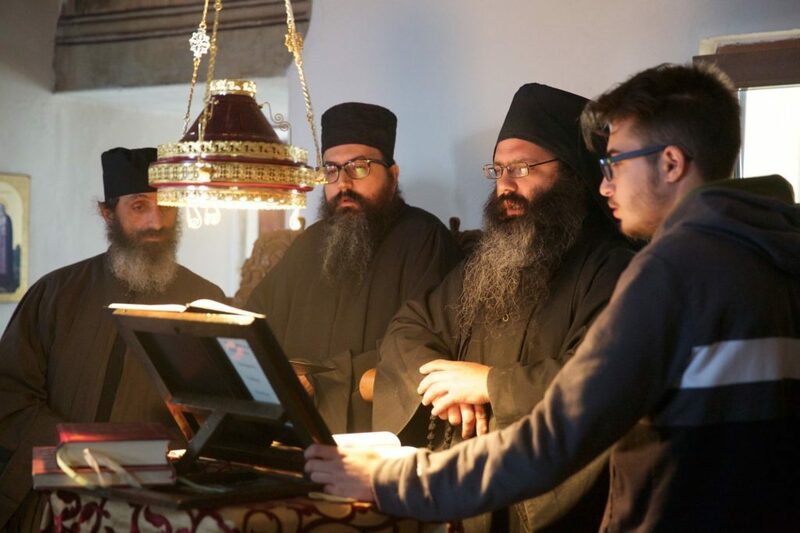 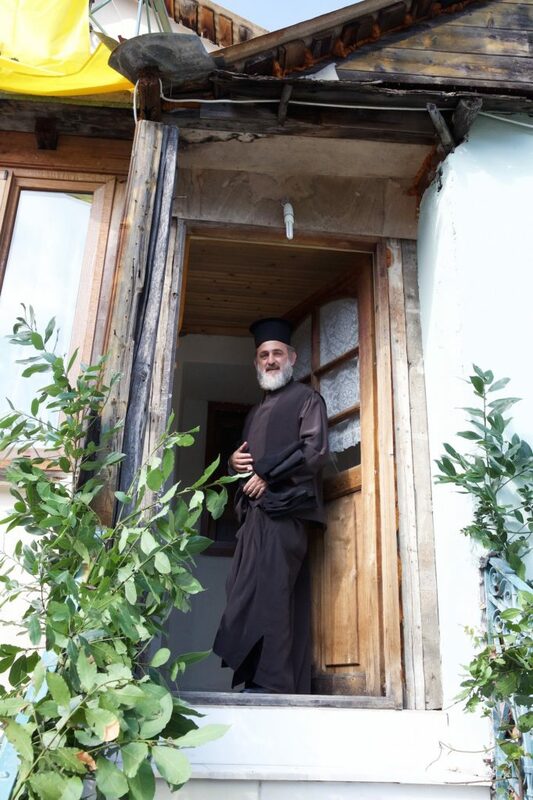 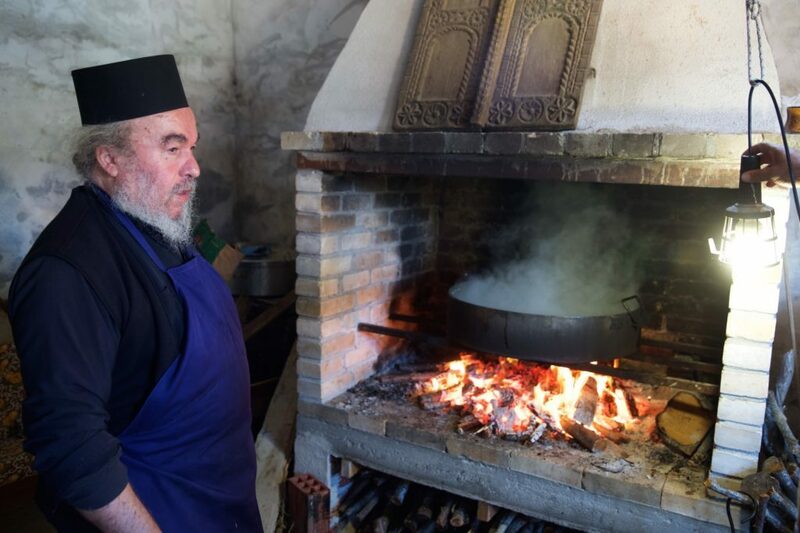 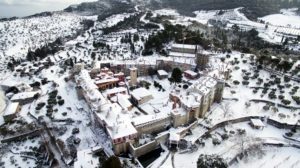 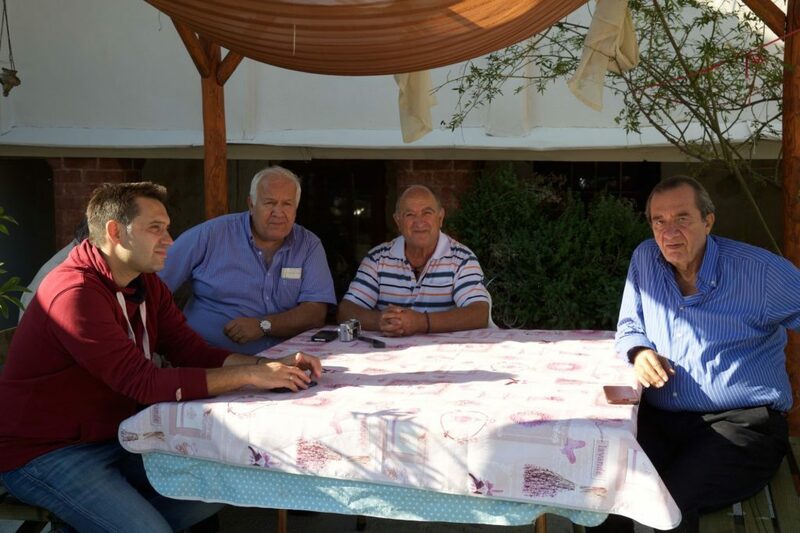 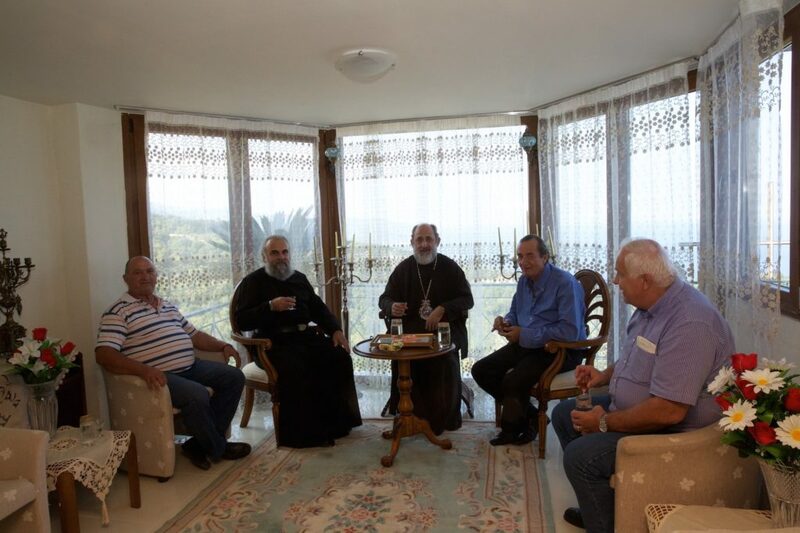 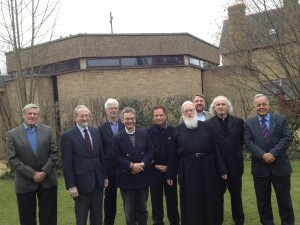 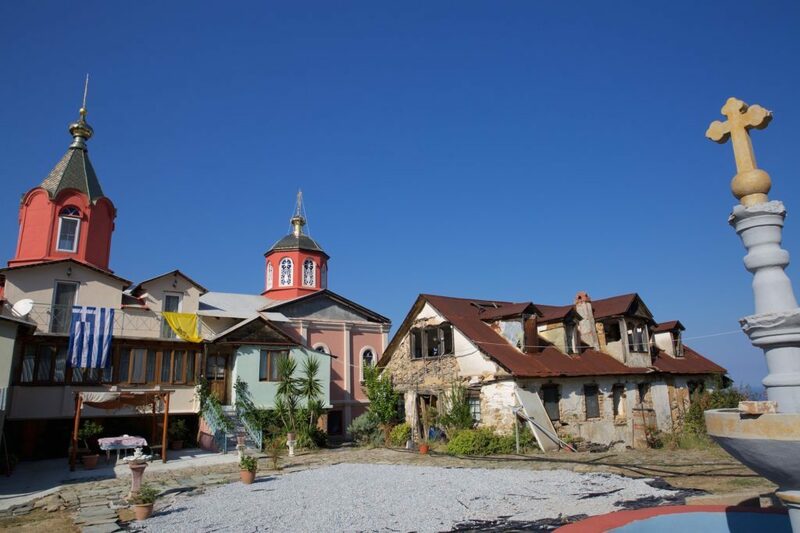 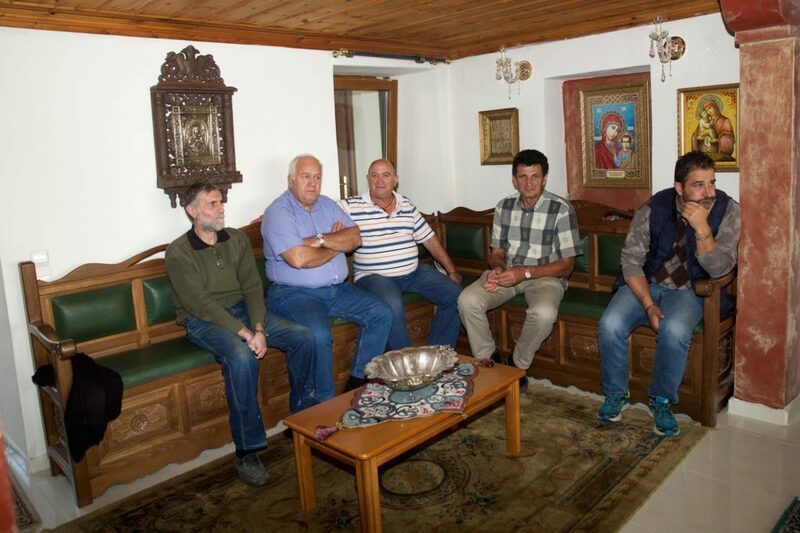 The warm reception and the refreshments were a sign of Athonite hospitality and love. 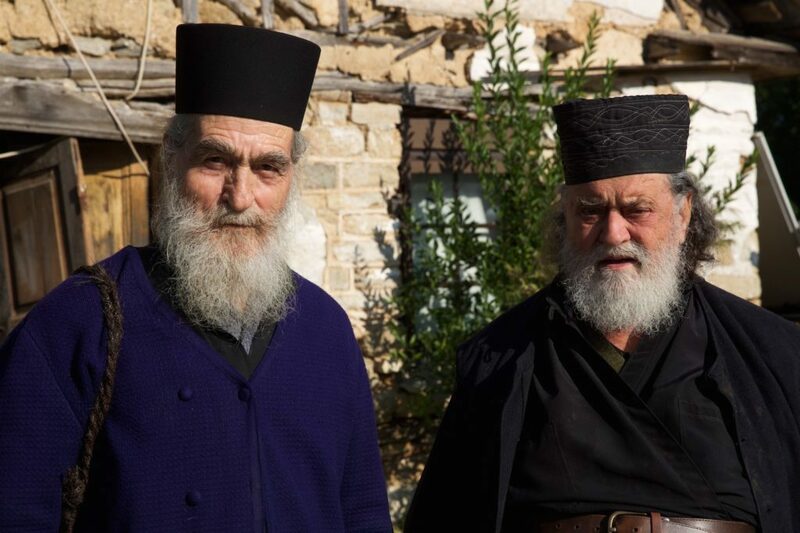 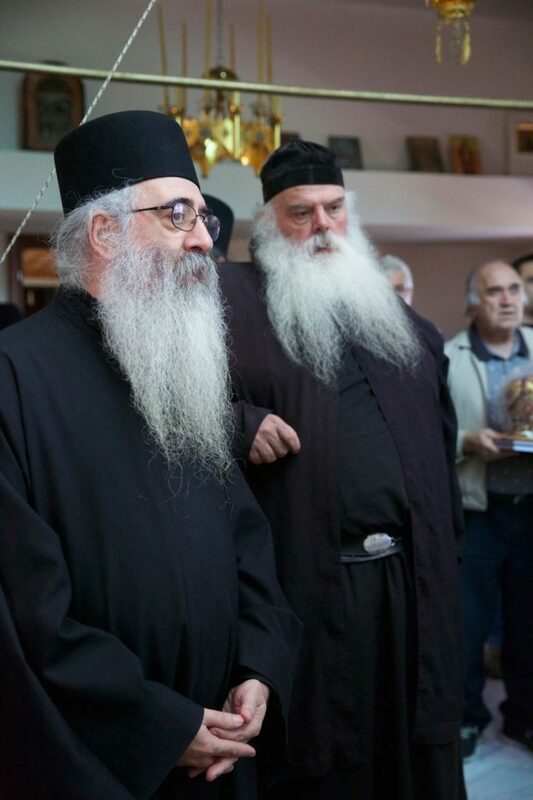 Elders from the neighbouring kellia, who seemed to be bringing the more than a thousand years of Athonite tradition, arrived for Vespers. 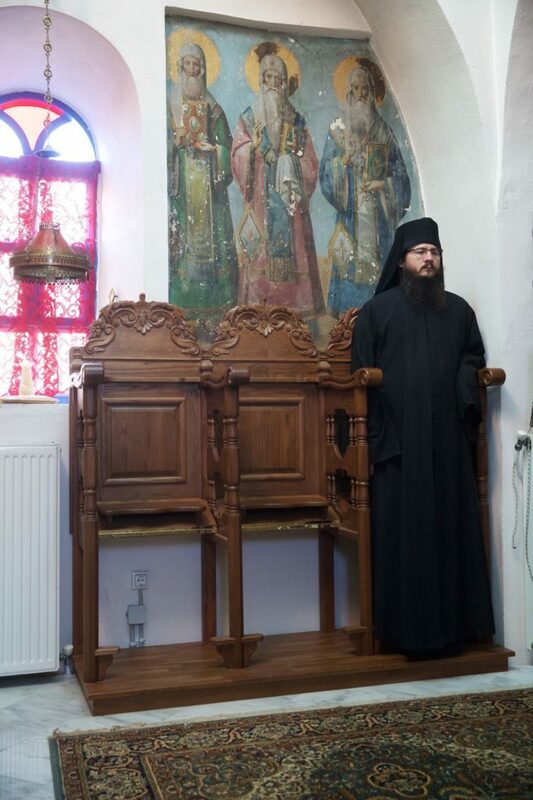 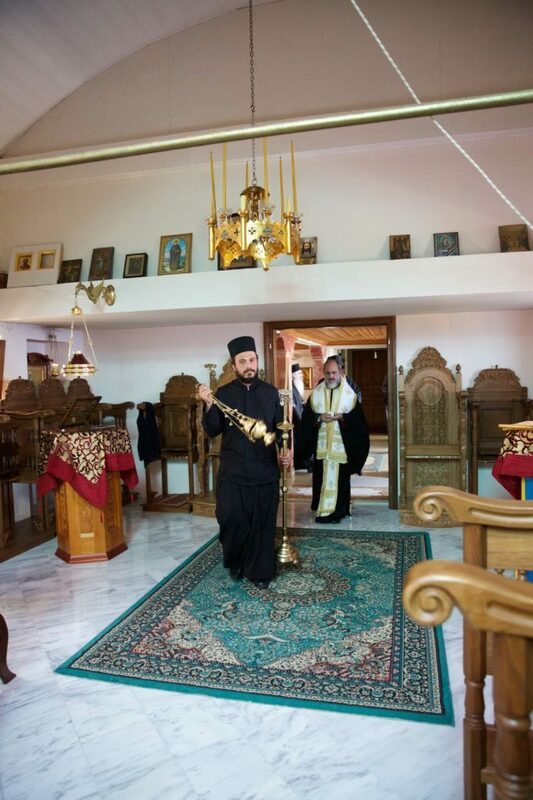 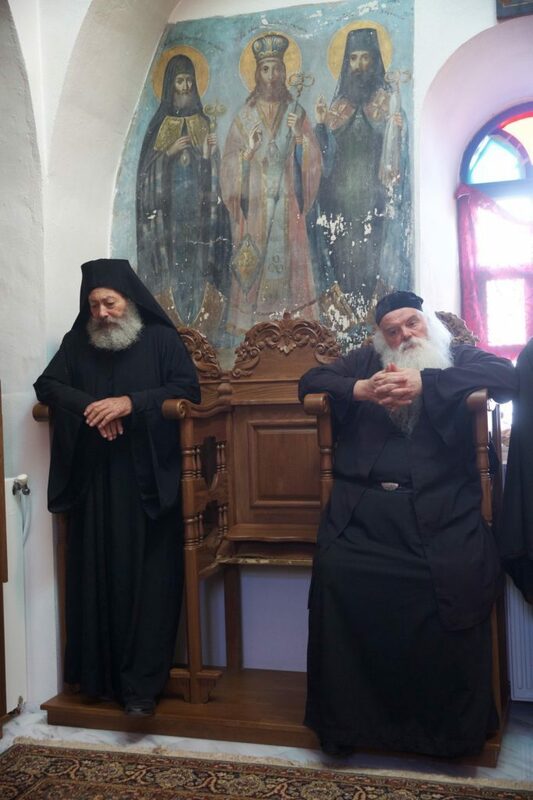 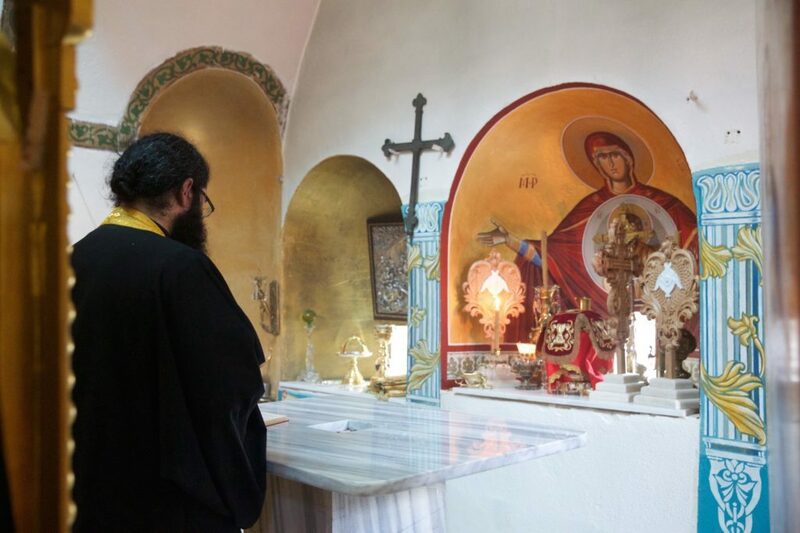 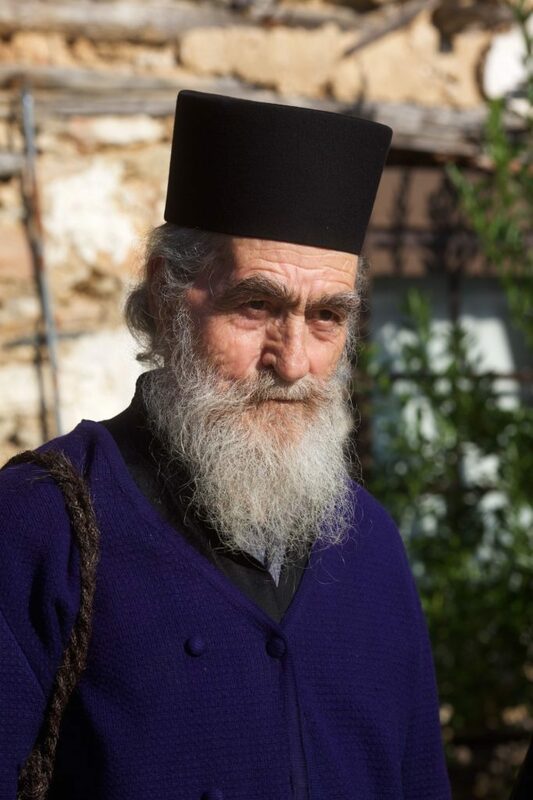 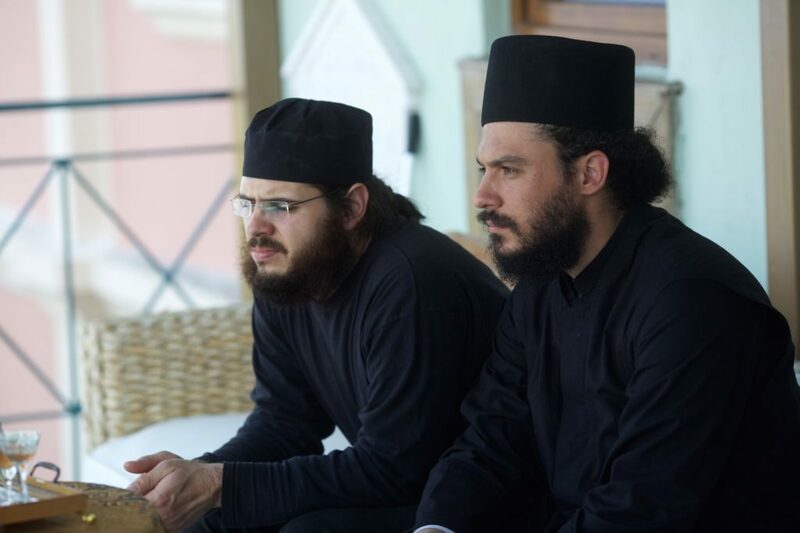 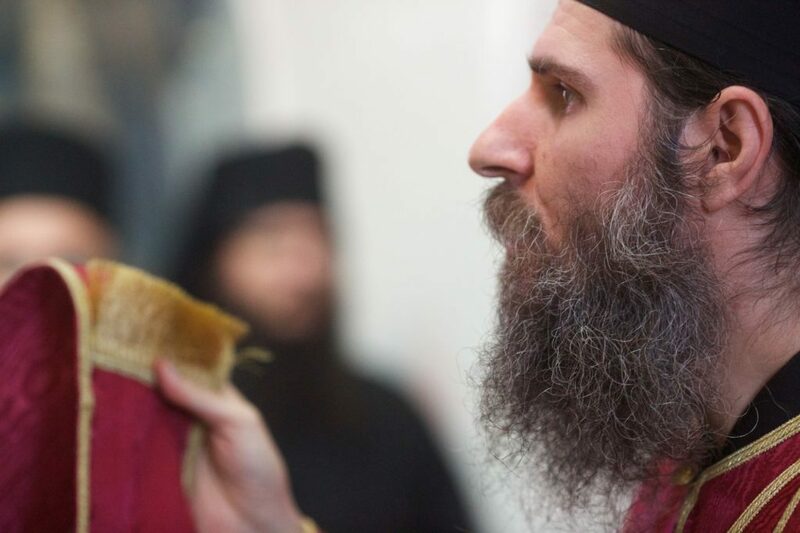 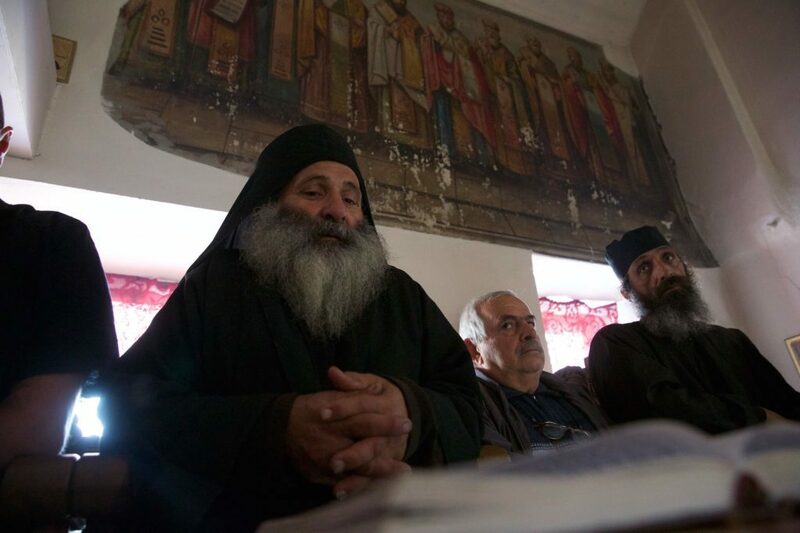 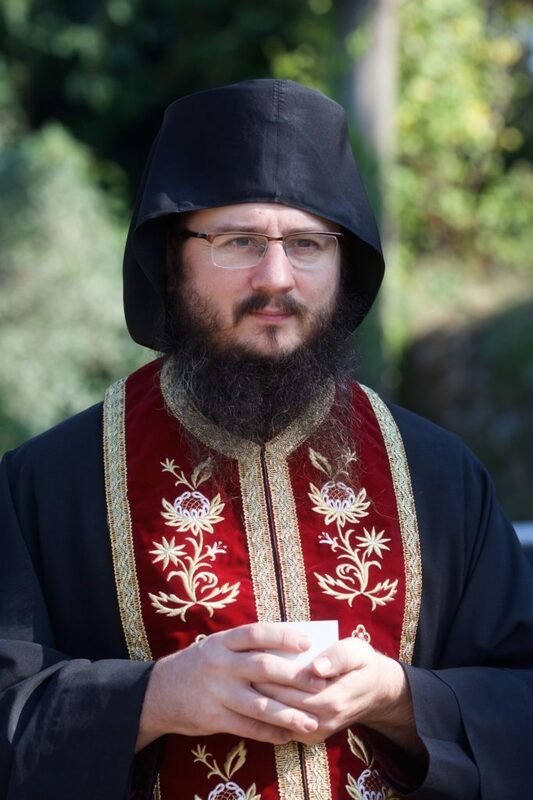 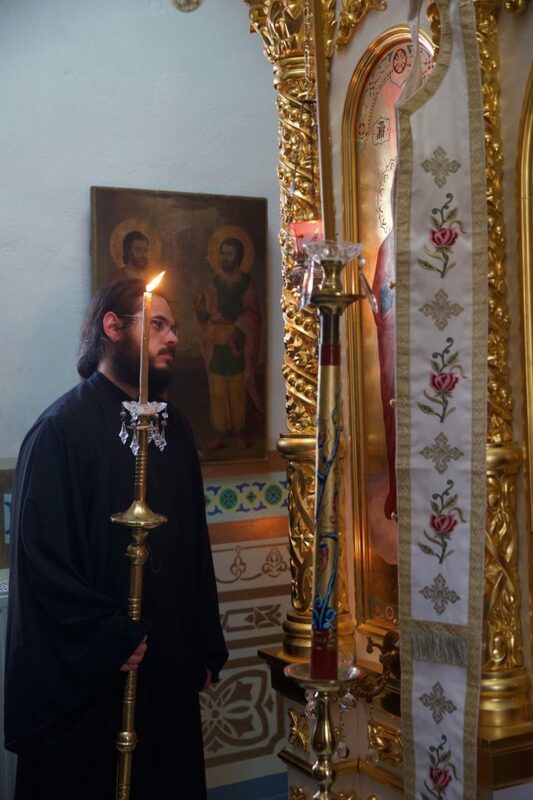 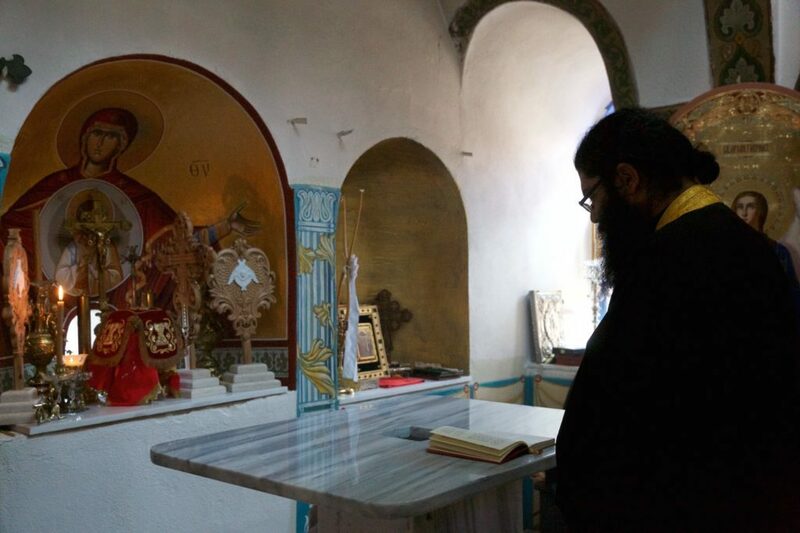 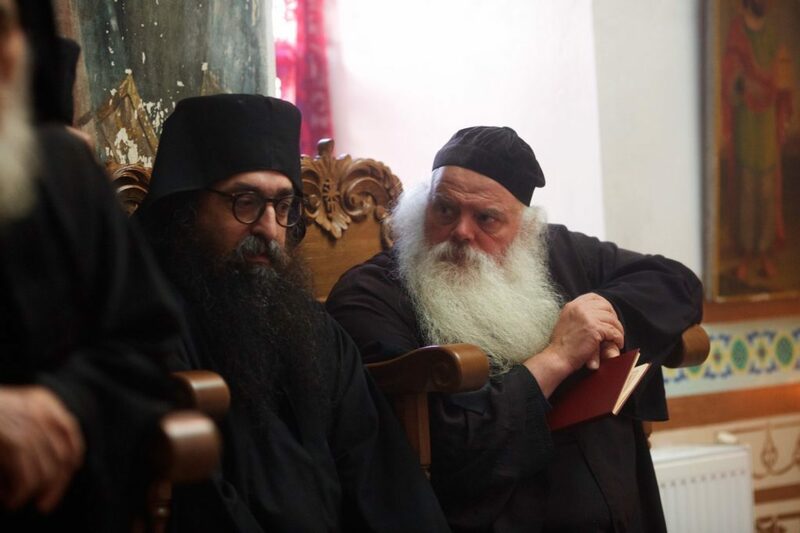 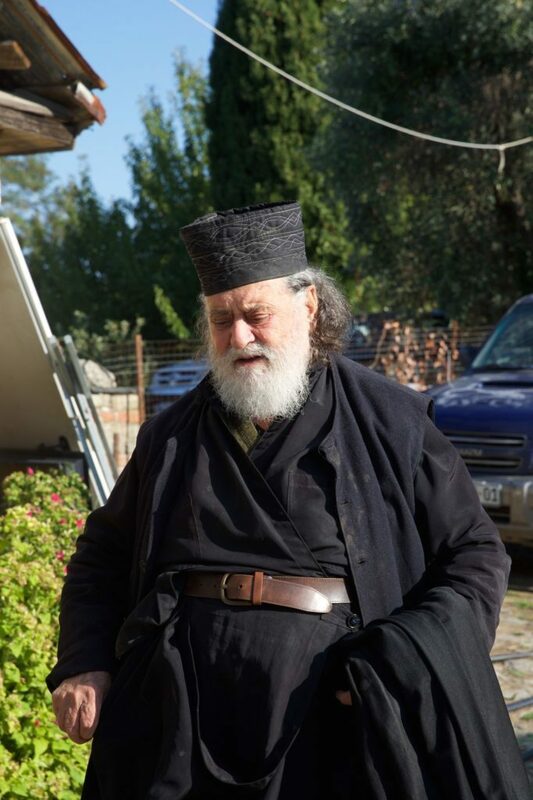 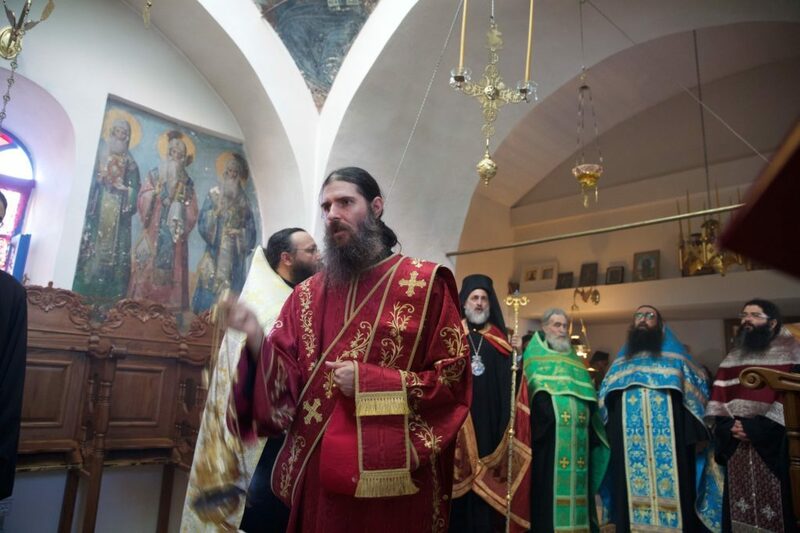 At every Athonite service, there are always lay members of the Church present. 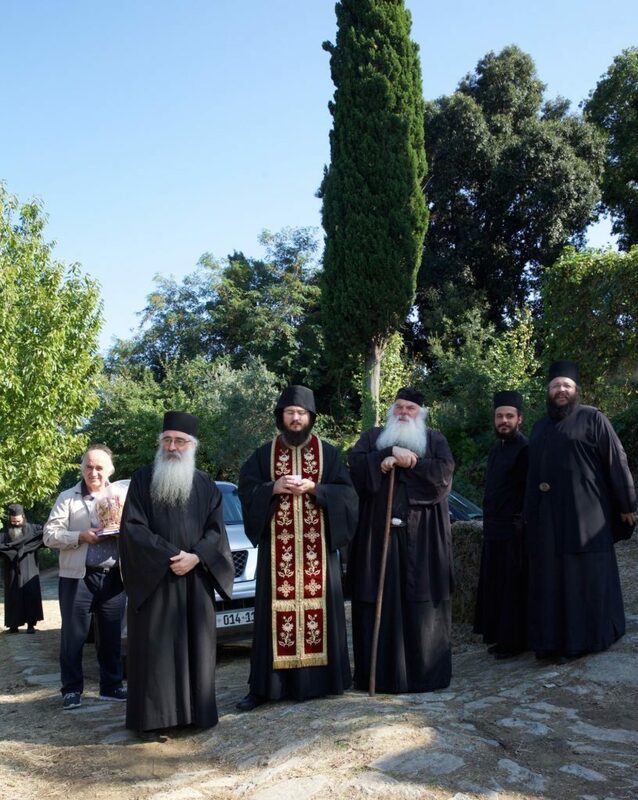 Fathers from the Holy Monastery of Karakallou, with Hieromonk Ignatios, who was in charge of the ceremonies, resting on his staff. 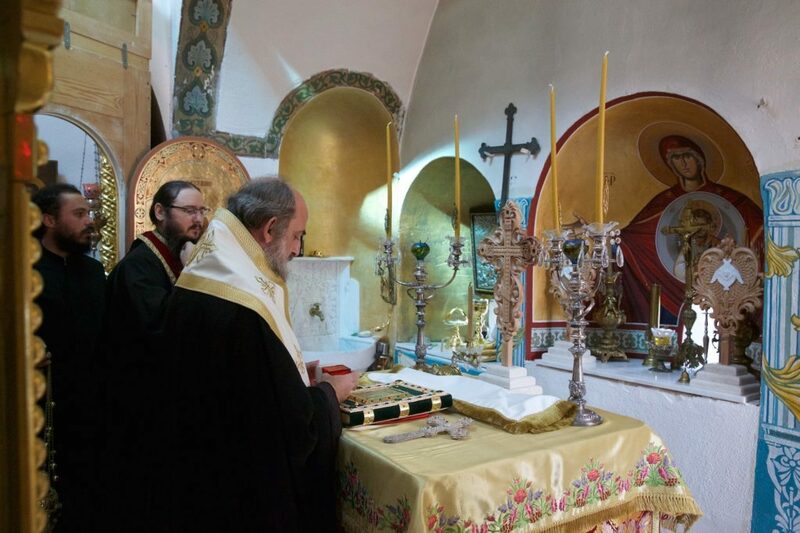 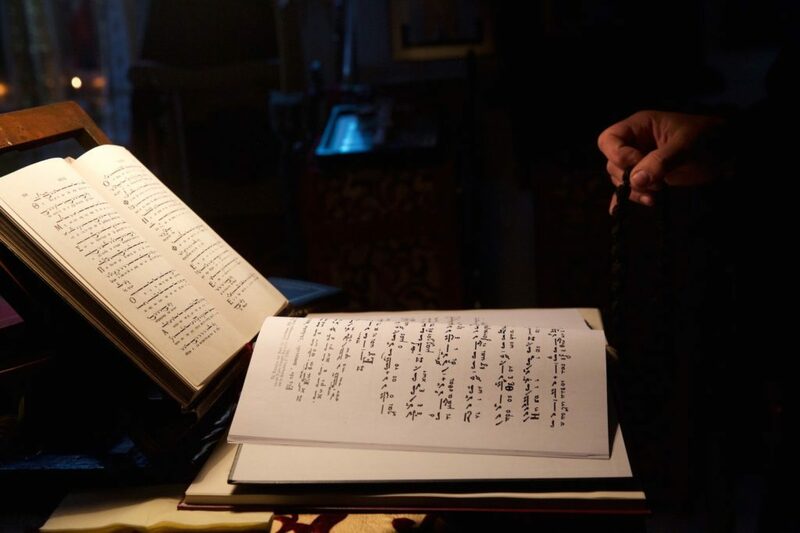 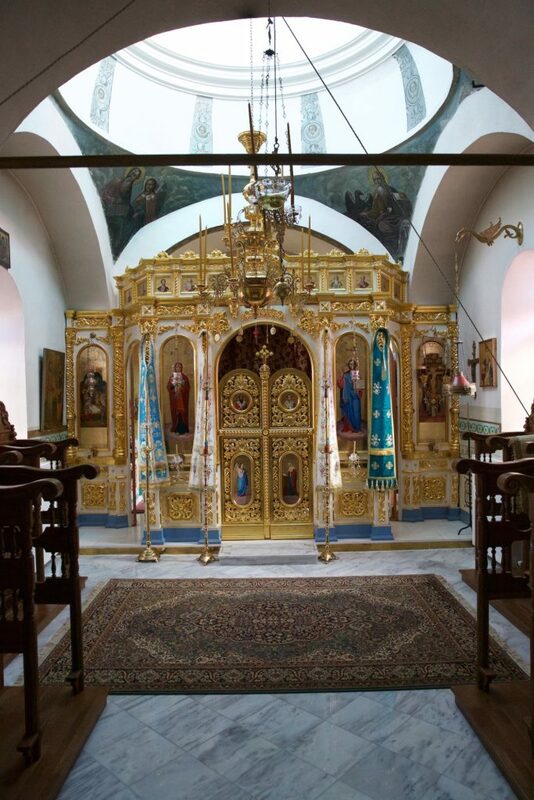 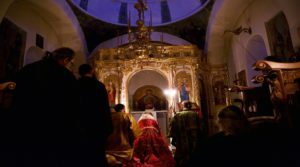 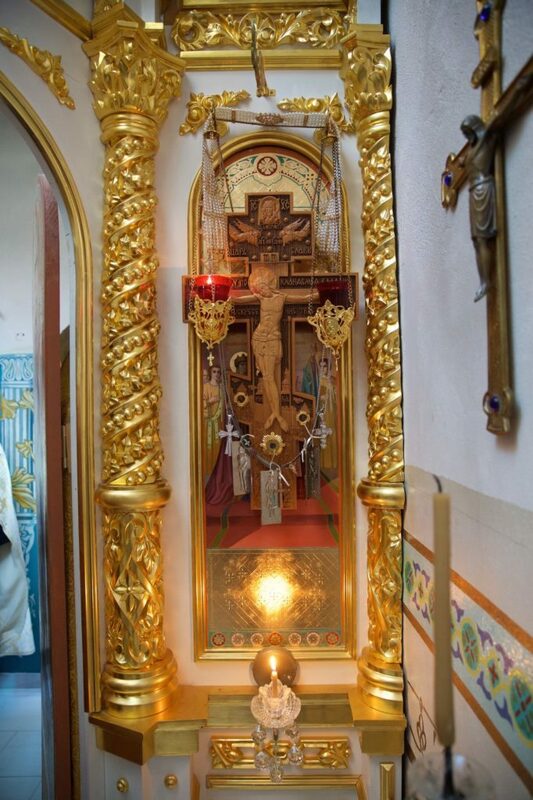 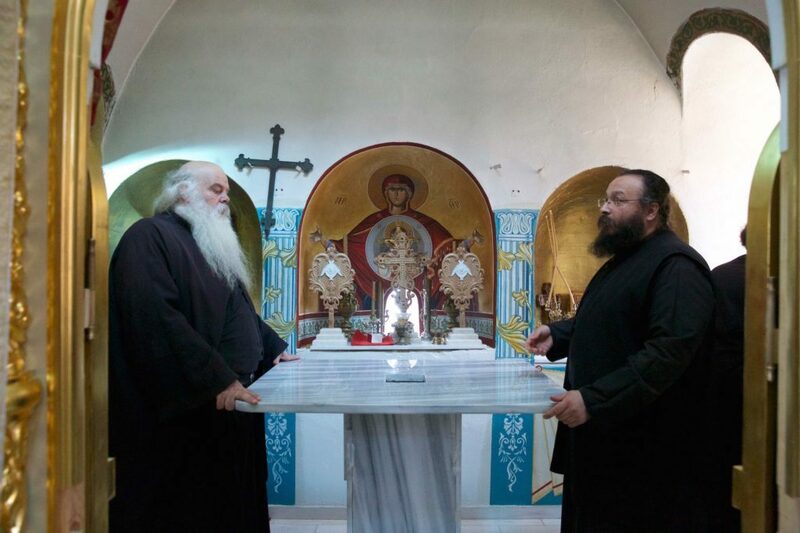 They had with them the Holy Relics from their monastery which were to be placed permanently in a special position in the altar of the church during the service of the inauguration. 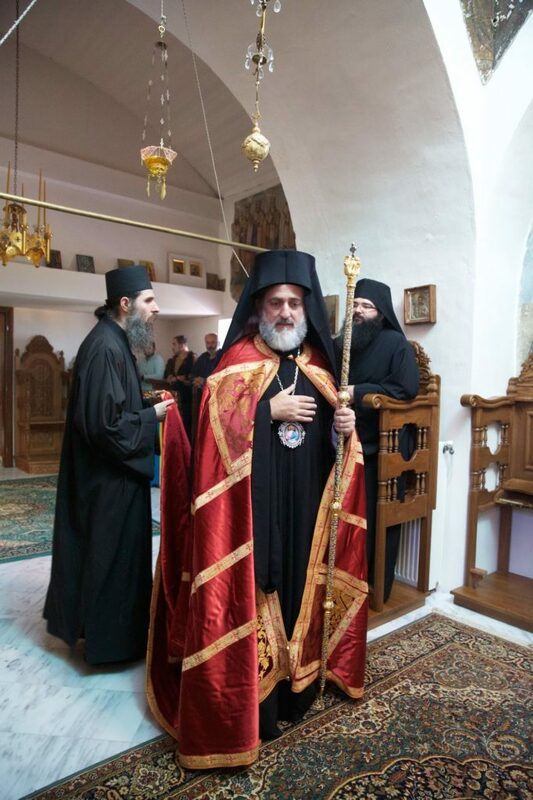 His Eminence receiving the Holy Relics at the entrance to the kelli. 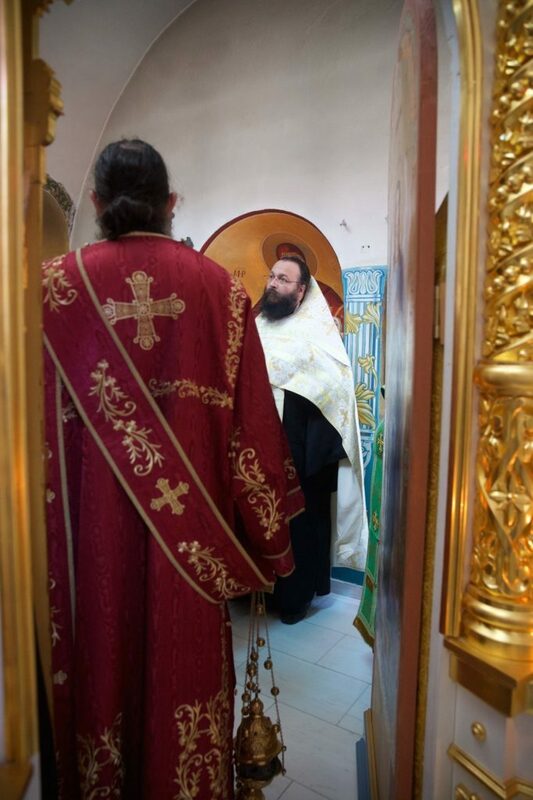 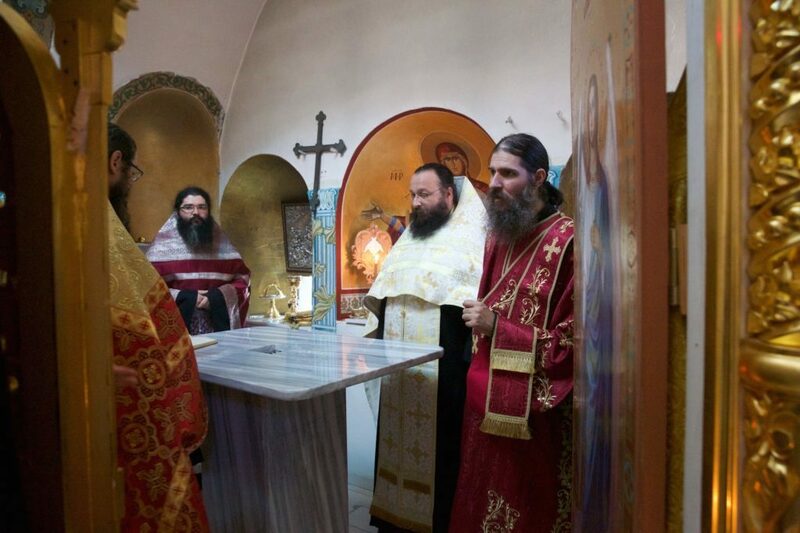 The metropolitan entering the church and depositing the Holy Relics. 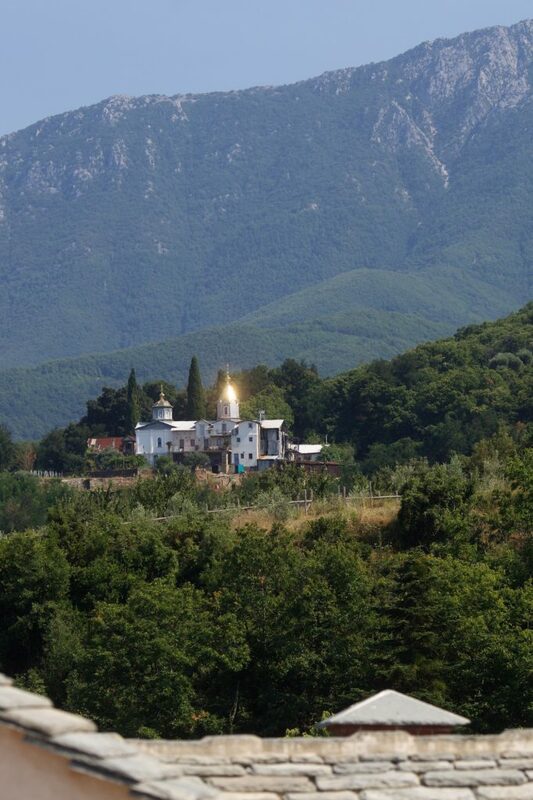 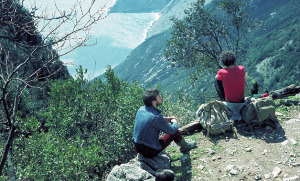 View from the kelli, from which the monasteries of Karakallou, Stavronikita and Pantokratoros can be seen. 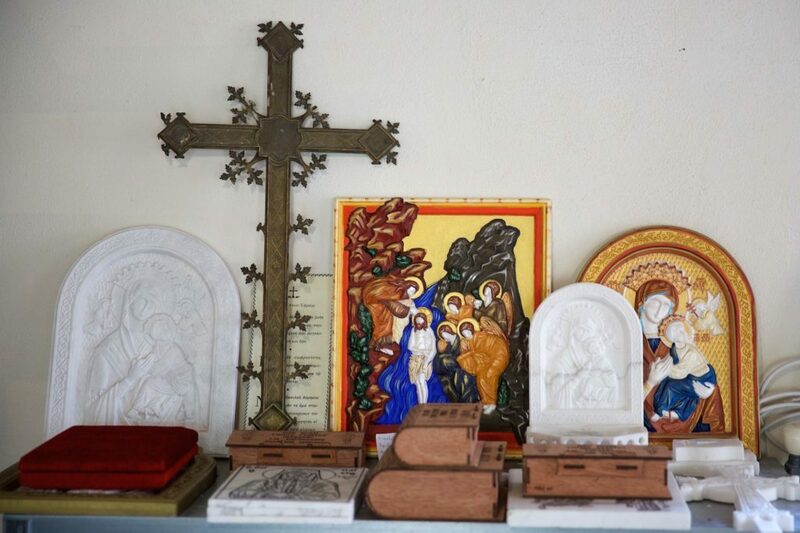 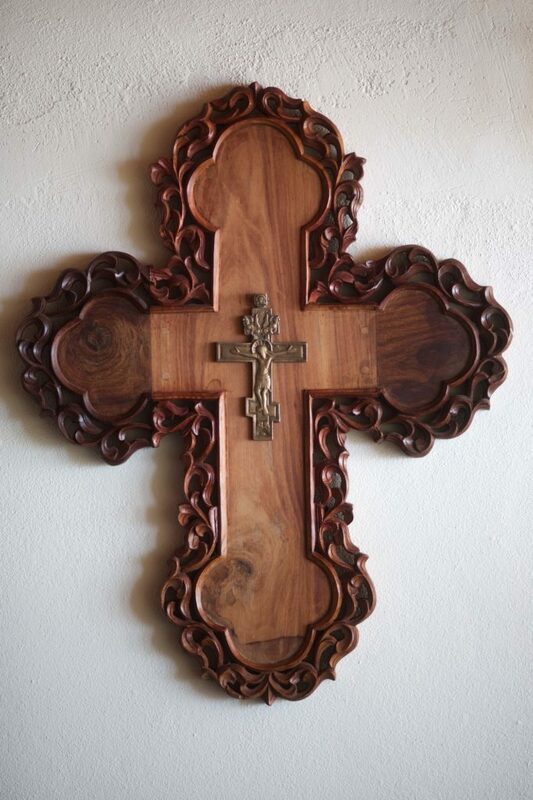 Craft products from the kelli which show the painstaking efforts of the Athonite monks, and also demonstrate artistic expression as liturgical art. 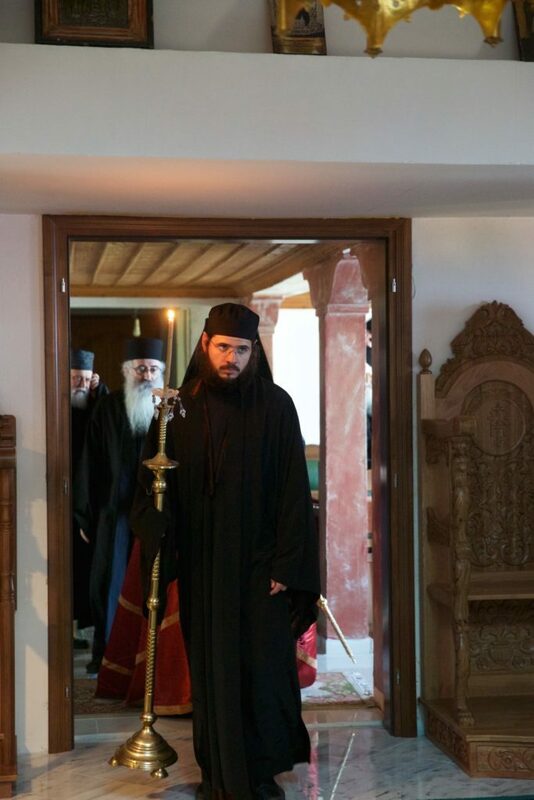 The metropolitan entering the church for the beginning of the service of the Inauguration Vespers. 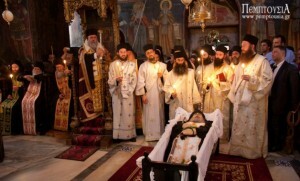 Beginning of Vespers, with the metropolitan celebrating. 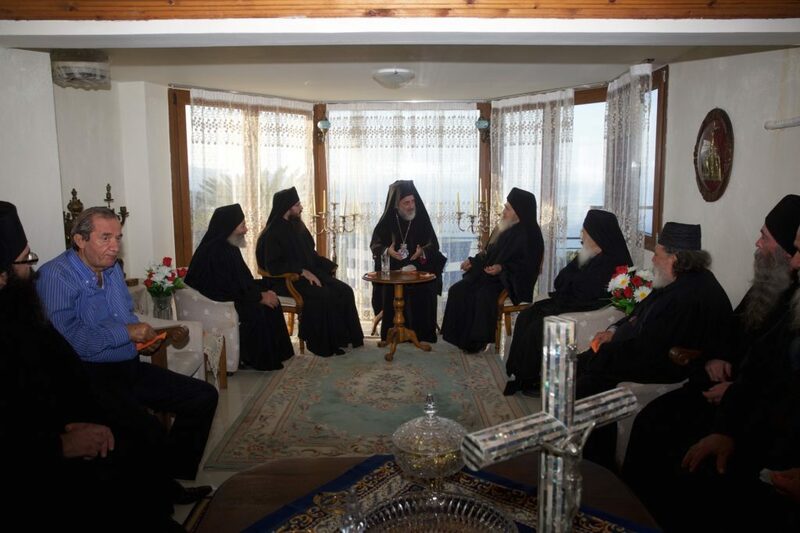 Spiritual discussion and refreshments after the end of Vespers. 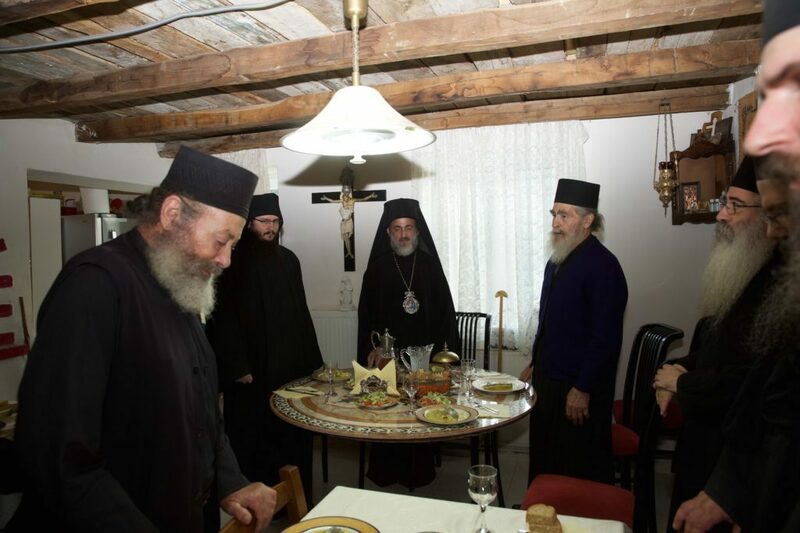 The preparation and setting of the table for the festal meal is an Athonite ritual with its own rule. 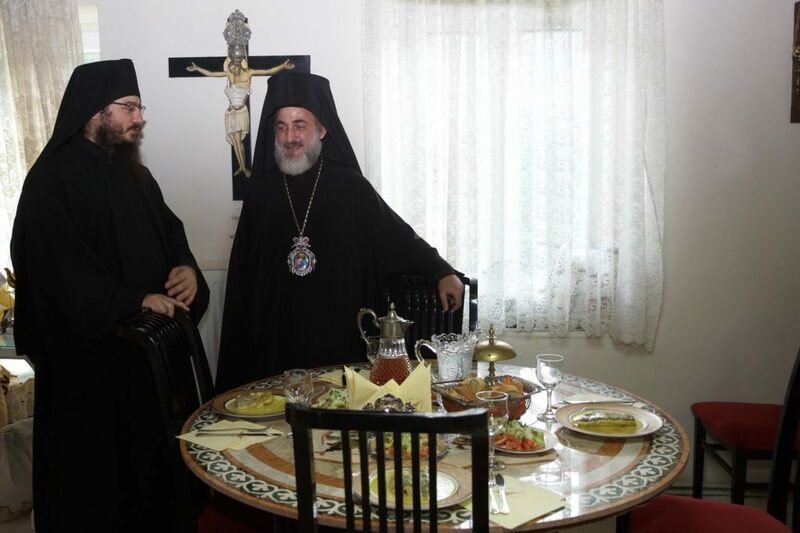 ‘The table is laden; eat your fill’. 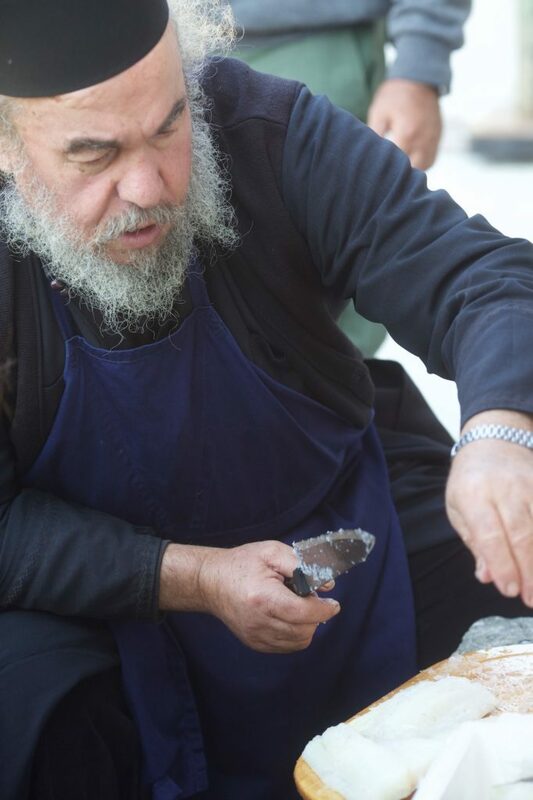 The metropolitan blesses the cook, Fr. 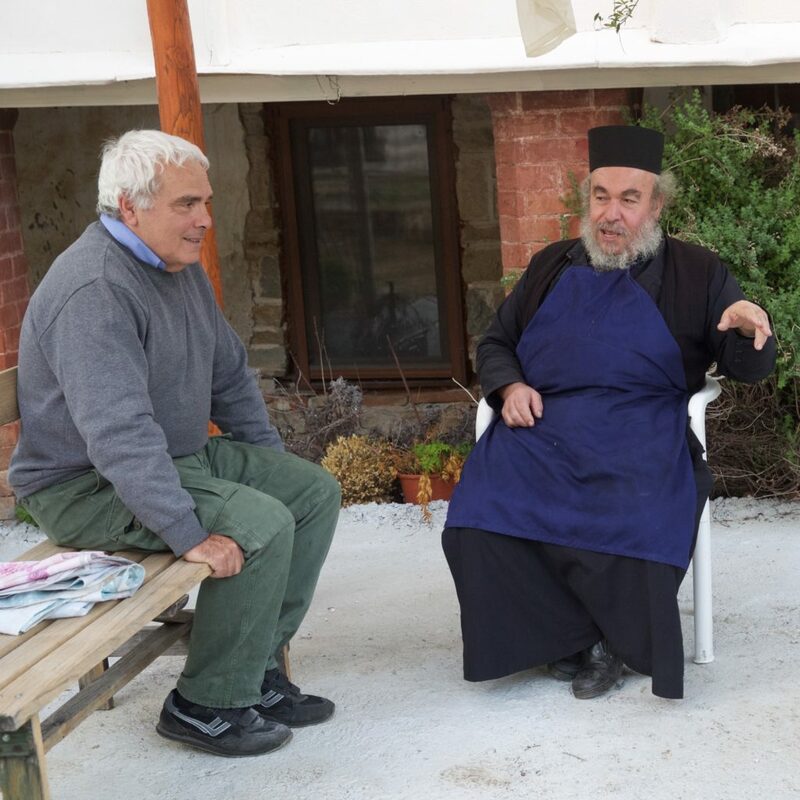 Averkios and thanks him for his efforts and skill in preparing the festal meal.